The thyroid is next to be disrupted when the body remains under serious imbalance from long term stress. 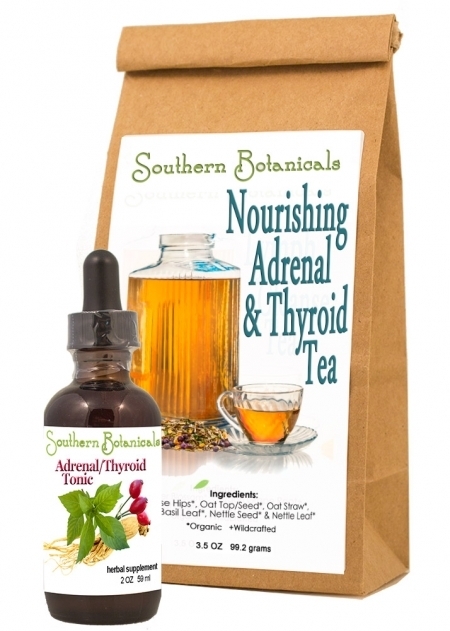 This nourishing Adrenal & Thyroid tea and tonic duo will help you feel grounded again. The herbal combination helps support the adrenals and thyroid while they rebuild over time, rather than further exhausting them with overstimulation. These two endocrine glands perform vital functions for daily energy. The adrenals are two small glands that sit atop your kidneys and mobilize the "fight or take flight" hormones, adrenaline and cortisol, to increase your heart rate and blood sugar under stressful or dangerous circumstances for emergency energy. The thyroid, a butterfly-shaped gland in the neck, regulates and maintains metabolism, providing sufficient energy for many body functions, growth and repair. Too much stress from our busy modern lifestyles and diets full of convenience foods, and even environmental toxins keep the adrenals overproducing hormones even when you are not running or fighting physically. The result is eventual burnout, with fatigue and difficulty rising to any kind of mental, physical or emotional challenge. Hormone imbalance from stressed adrenals can cause inflammation which in turn depresses thyroid activity, setting up long term problems with metabolism, weight gain, bowel irregularity, low lidido, reduced protein synthesis for growth and repair, difficulty fighting off infections and lower energy levels. Exhausted adrenals and impaired thyroid function can leave you with disrupted sleep patterns and unhealthy food cravings with the result that you feel achy, irritable, "foggy headed" and just plain exhausted and unable to function as you need to. By supplying a delicate-tasting combination of herbal nutrients and adaptogenic support for the adrenal and thyroid glands, this herbal duo makes it easy to over time regain a feeling of renewed vitality and strength. Overcome fatigue and get back to a life with verve! Ingredients (*Organic, +Wildcrafted): Ashwaganda root+, Eleuthero root*, Rose hips*, Oat top/seed*, Oat straw*, Holy Basil leaf*, Nettle root* Nettle seed* and Nettle leaf* in a base of distilled water and certified organic GMO-free alcohol. Ingredients (*Organic, +Wildcrafted): Rose Hips*, Oat Top/Seed*, Oat Straw* Holy Basil Leaf*, Nettle Seed* & Nettle Leaf*. Take 1-2 droppersful of Adrenal/Thyroid Tonic 3 times a day under the tongue or in 2 oz water. This is mildly energizing so it is not recommended before bed. taken earlier in the day, it can help to sleep at night. Drink fresh daily, 2 to 4 cups a day. We recommend making a pint or quart of tea at a time to drink all day. This tea is slightly energizing, so drink it in the morning and throughout the day, but not just before bed. 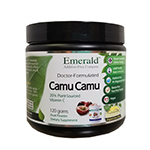 This tea is not powdered, but contans whole or cut dried herbs, leaves, seeds and fruit which benefit from soaking and simmering to extract their beneficial properties. Mild Tea: 1 Tablespoon dry herbs in each pint of water, or 2 Tablespoons per quart. Strong Tea: 3 Tablespoons per quart of water. 1. Put dry tea in a tea ball of stainless steel in a small pot of pure water to soak. If you have no tea ball, just soak the herbs in the pot of water. You can strain it later when it is ready. 2. Soak for at least 15 minutes to a coule of hours (even overnight is fine) in covered pot. 3. Bring to a simmer in covered pot and immediately turn off, and leave on warm stove to steep. 4. Pour off tea into a cup and enjoy. 5. May be stored in a container or left in the pot to drink all day.